Google Maps is a web mapping service developed by Google. 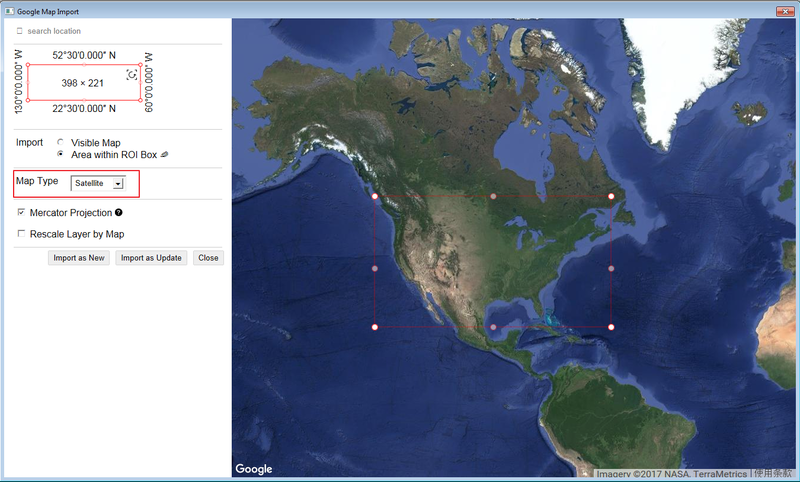 Origin now supports importing google map directly into an Origin graph. Follow this link to install the app. 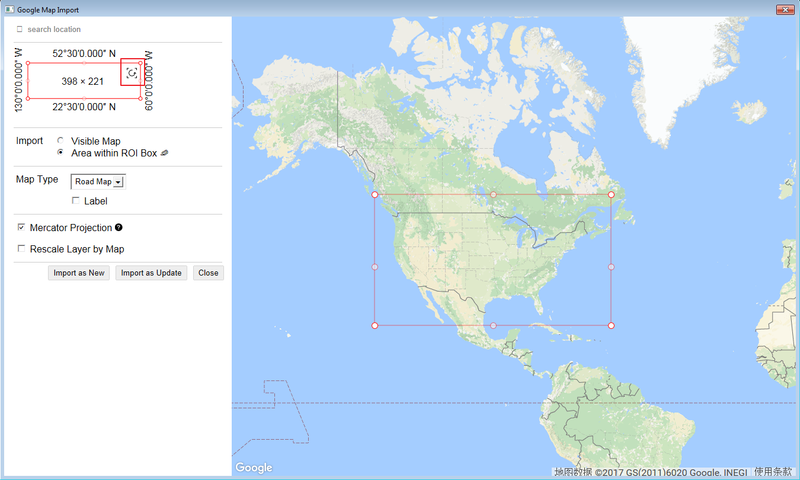 In this example, we will show you how to embed google map into a data plot of geographical information (e.g. 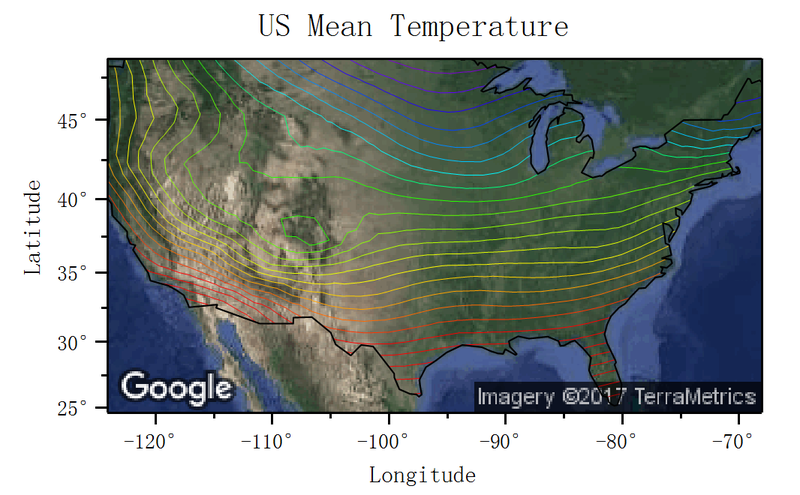 temperature) to achieve a more intuitive presentation of the data. Download the attached file. Open the opj file, you will see a worksheet in Folder1 as shown below. 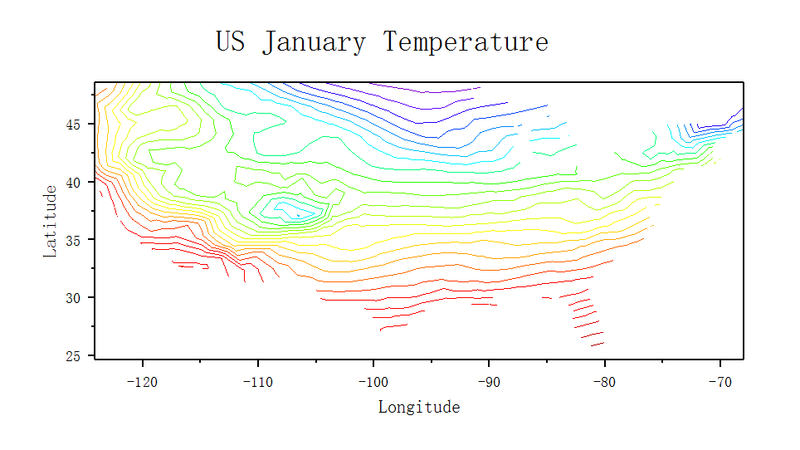 It has January temparature recorded in different US cities and US boundary data in column E and F. You can also check out the result graph in Folder2. 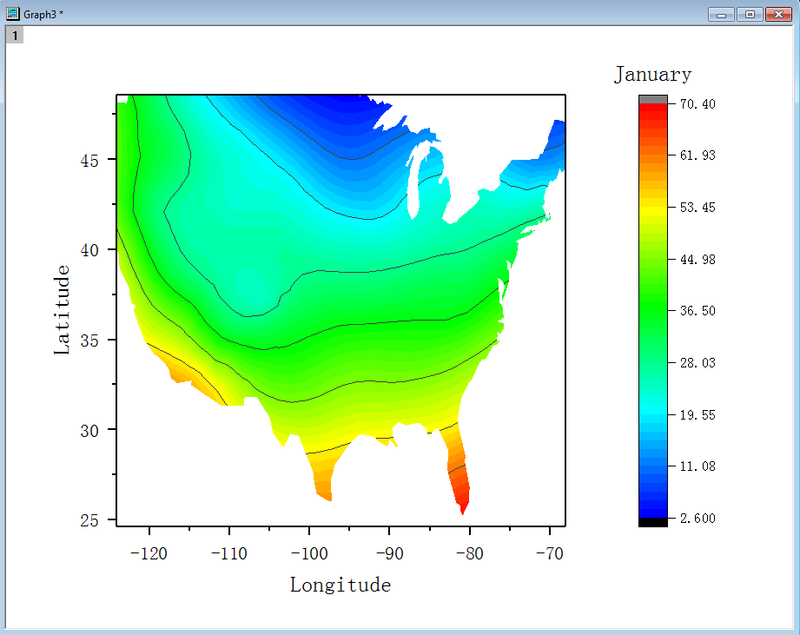 Highlight column C(Z), select Plot:Contour:Contour-Color Fill from top menu to generate a contour plot. Double click the plot to launch the Plot Details dialog. 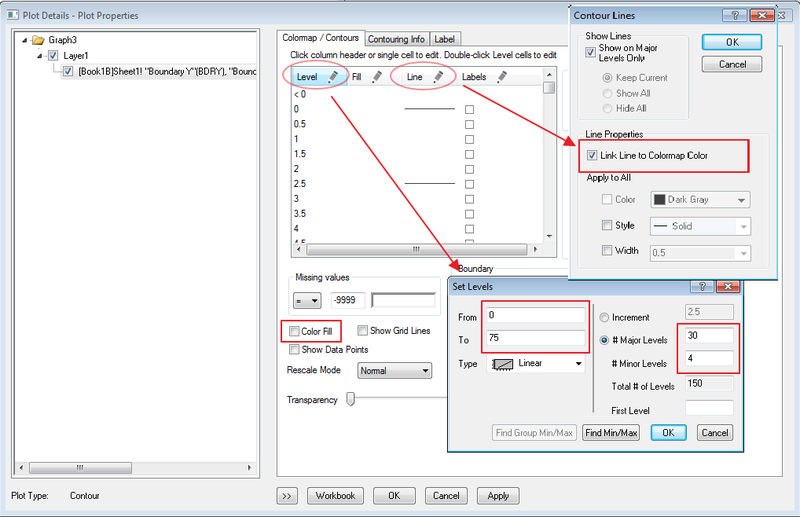 Under Contouring info tab, select Custom Boundary. 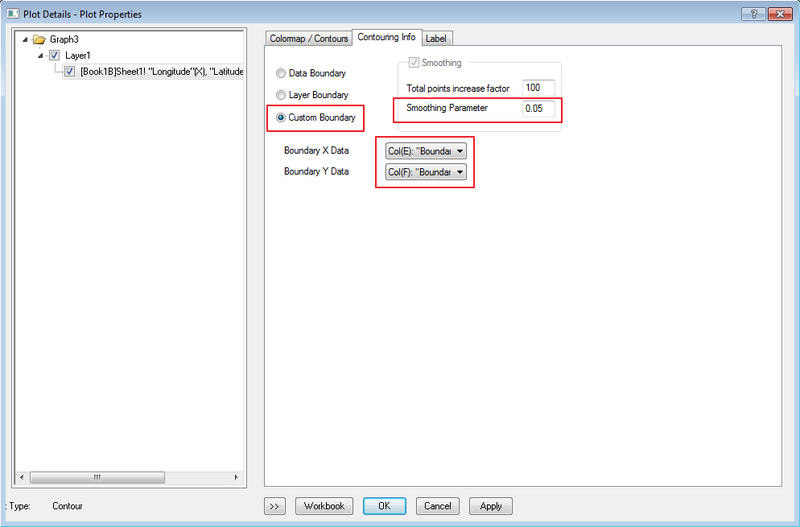 Set boundary X Data and Y Data to Col(E) and Col(F). Set the Smoothing Parameter to 0.05. Click Apply. The contour is plotted in US boundary but looks the map is distorted. Select Layer1 on the left panel. Under Size/Speed tab, check Link Axis Length to Scale with X:Y Ratio 1. Click Apply. The map will be more proportional. Now we are going to make some modification on the format of the plot. 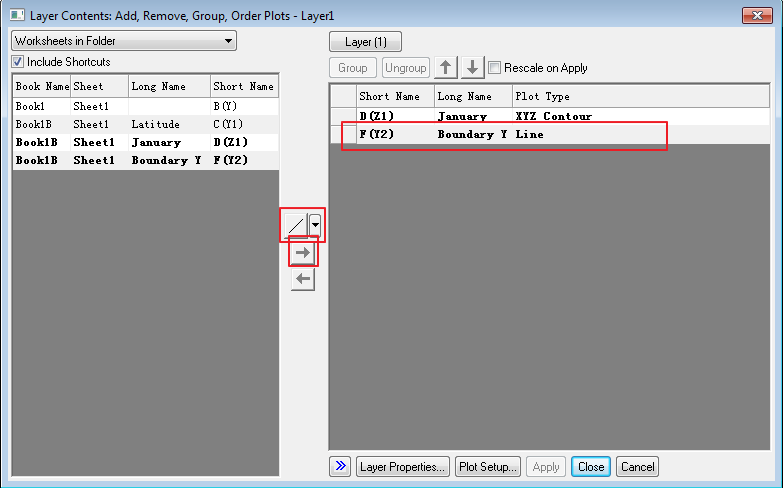 select Plot node [Book1B]Sheet1!… on left panel. 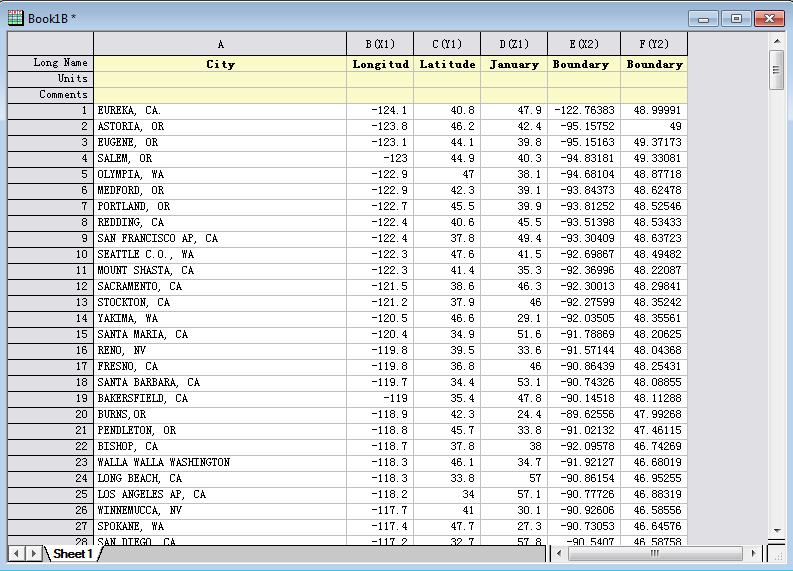 On Colormap/Contours tab, click the column header Fill…. 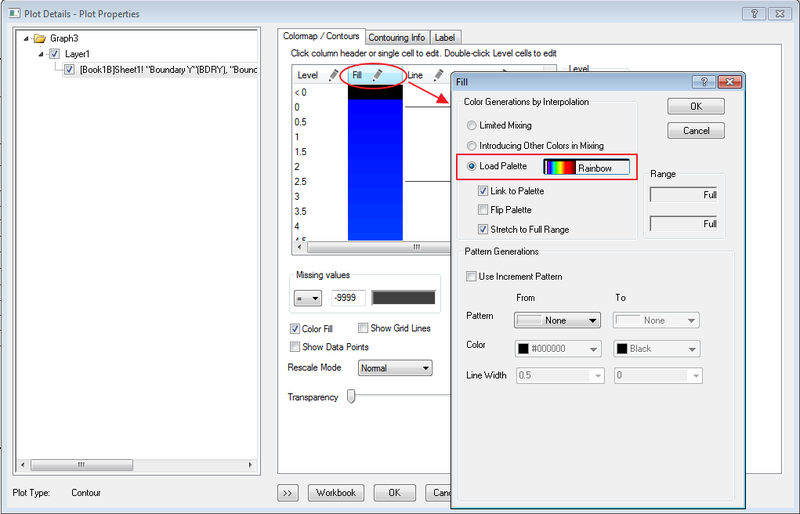 Select Load Palette, and click Rainbow in the dropdown list. Then click OK.
Make change of the settings in level and line column headers as shown below. 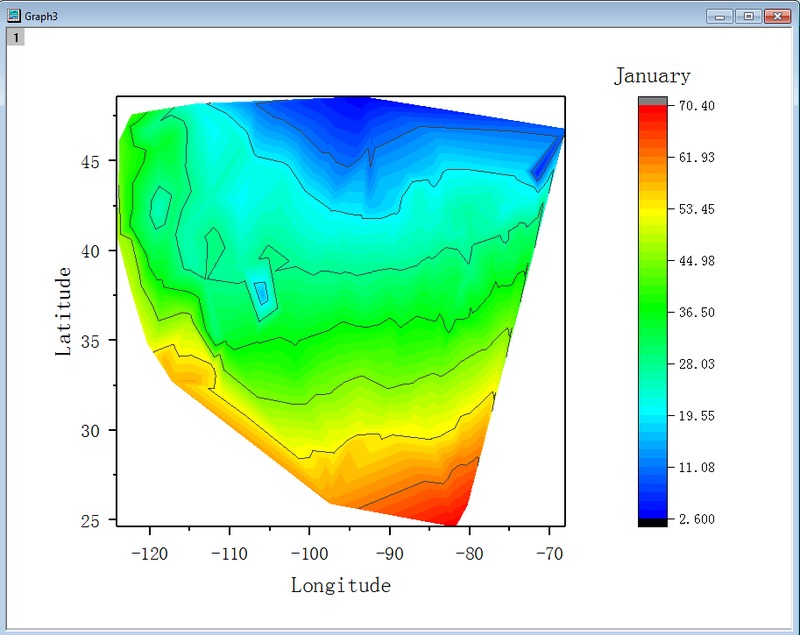 This is basically to have the contour lines following the filling color of the contour plot. 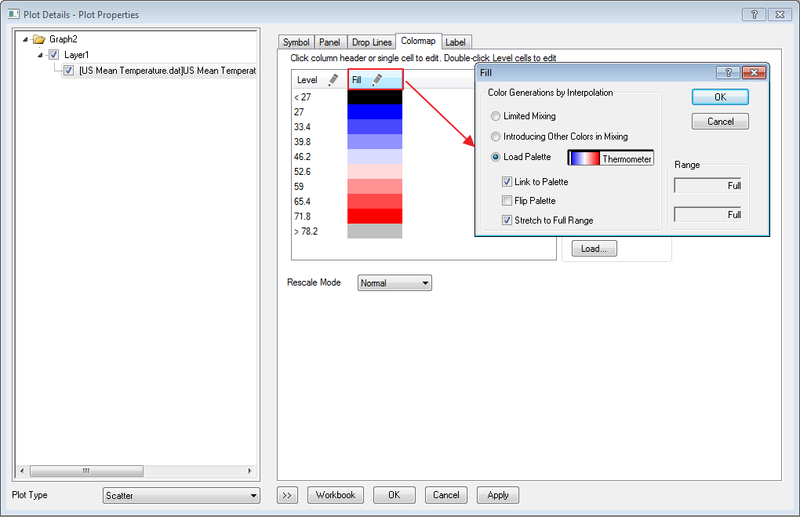 Also uncheck Color Fill in the main panel so that only colored contour lines are left on the graph. Remove the empty color scale in the graph. Add a title for the graph. To have the page fit the size of the graph layer, select Graph: Fit Page to Layers…, click OK .
Now we are going to add the boundary line into the graph. 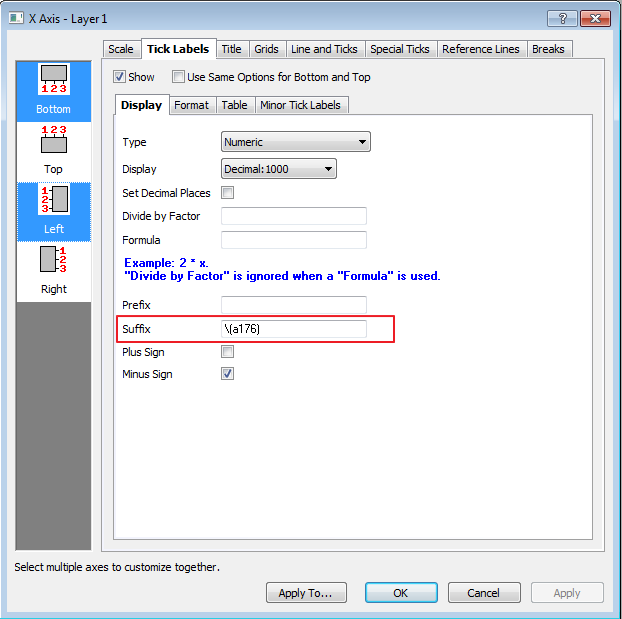 Right Click the graph and select Layer Contents. Select the row of Boundary dataset in the left panel, set the plot style to line, click the right arrow to move it to the right panel. Click OK.
With the graph active, select the Google Map Import app to bring up the dialog. Change the Map Type to Satellite. (Other map type includes Road Map, Terrain, Hybrid ) Click Import as Update. Now the graph is updated with a US map as background. Double click the X axis, under Tick Labels tab, select Bottom and Left in the left panel, input \(a176) in Suffix. Click OK.
Below shows the result graph. Note: We have released a new blog to show you another case of using this Google Map app.